It is well known that the Burke and Wills Expedition was the first Australian expedition to make use of large numbers of camels as well as horses and wagons, yet despite all this livestock, a great deal of the expedition was conducted on foot. Why would the most lavishly equipped expedition ever mounted in Australia expect the participants to walk across the continent ? Why did Burke walk ? After the arrival of the First Fleet at Sydney Cove, the availability of horses in New South Wales was limited. Early expeditions lacked sufficient horses for all participants to be mounted and the expedition assistants, who were mainly Marines and convicts, were expected to walk. This situation faced Evans, Oxley, Hume, Hovell and Sturt and continued well into the 1840s when even Mitchell’s large expeditions were not fully mounted. After around 1845 it became standard practice to have sufficient horses for the entire expedition to be mounted. This was particularly important when exploring the central desert areas when increased mobility and the ability to cover larger distances to find water became necessary. Leichhardt took nine men and seventeen horses on his 1844-5 expedition. Gregory took eighteen men and fifty-one horses on his 1855-6 North Australian Expedition. In 1858 when setting out to search for Leichhardt he took nine men, thirty-one pack-horses and nine saddle-horses. Stuart took twelve men and forty-nine horses on his fifth expedition in 1861. The Victorian party that left Royal Park consisted of nineteen men and around 68 horses and camels. Upon departure George Landells, second in command and in charge of the camels, wished to save the camels’ strength for the dry, desert stages and was unhappy with the 150kg loads Burke expected them to carry. Landells’ objection meant Burke was suddenly faced with an additional 2½ to 3 tonnes of stores to transport. As a result the horses were loaded with stores thereby reducing the number of horses available for riding and Burke hired an additional three wagons. (The three hired wagons cost £110 a week which was a huge expense given the men were paid £120 a year). On departure Burke rode in the lead on his grey horse, Billy, followed by two assistants (McDonough and either Langan, McIlwaine, Lane or Brooks) on foot each leading pack-horses. Behind them Landells, Dr Becker, King, Drakeford and a sepoy were mounted on camels. Three sepoys on foot led the remaining camels, so it is clear even on the very first day of the expedition some of the men were without mounts and were expected to walk. Riding on camels is a much more pleasant process than I anticipated, and for my work I find it much better than riding on horseback. The saddles, as you are aware, are double, so I sit on the back portion behind the hump, and pack my instruments in front. I can thus ride on, keeping my journal and making calculations; and need only stop the camel when I want to take any bearings carefully; but the barometers must be read and registered without halting. Crossing the Terrick Terrick Plains by Ludwig Becker, 29 August 1860. However the wet winter weather made the roads muddy and the wagons struggled to keep up with the horses and camels. Burke left some of the equipment behind in Swan Hill and Balranald to lighten the load, but the soft sand of the mallee country slowed the wagons further and the expedition’s progress was severely hampered. By the 1st October they had been traveling for six weeks and while Burke, the horses and camels were at the Darling River, the wagons were back at Arumpo, having traveled just 500 km from Melbourne. 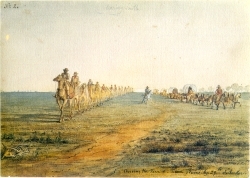 This meant the wagons had averaged only 11km a day and Burke made the decision that they would be abandoned and the equipment carried on the horses and camels. …nearly every man has walked some 300 miles, Messrs Burke and Wills riding the whole distance, excepting a one day walk to Wills. 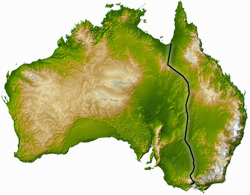 In the presence of Professor Neumeyer, Mr Burke said that with the exception of Wills, every man should walk to the Gulf of Carpentaria. 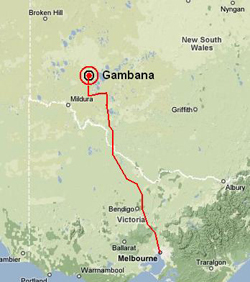 From Gambana the men walked the 200 km to Menindie. From Menindie, the eight men that travelled north walked most of the 920 km to Cooper Creek. On leaving the Cooper for the Gulf, Burke, Wills, King and Gray took six camels and one horse, but only rode for the first few days. At the Commission of Enquiry, King recalled they rode the horse and camels for the first two days and then walked. Question 730 to John King – How did you travel, on foot or how ? – We rode a short distance tracing down the creek and after leaving the creek we walked. Q732. Then having left the creek you travelled on foot ? – Yes. Q733. How did you regulate your daily proceedings; was there any particular order; or had you any particular charge of anything apportioned among the men ? – I had to lead the six camels and Gray had to lead the horse; Mr Burke and Mr Wills were walking ahead. Q738. Did you say Mr Burke and Mr Wills generally went a-head on foot ?-Yes, on foot. Q739. And you on foot leading the camels, and Gray leading the horse ?-Yes. Loaded with 800 pints of water: four riding camels carried 130 pints each, horse 150, two pack camels 50 each and 5 pints each man. The distance they walked from the Cooper to the Gulf was 1500 km. On the return trip they rode some of the way and walked some of the way. King told the Commisson that usually two men rode and two walked each day and Gray rode when he was ill, and he often complained of being ill. On the 21 April 1861, the final day of the journey when Burke, Wills and King returned to the Cooper Depot, Burke rode the camel Landa and Wills and King rode on the camel Rajah. 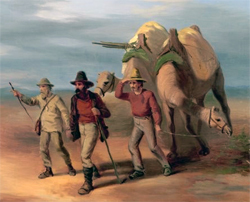 Chevalier’s painting, Return to Coopers Creek, shows the three men walking back – they may have walked the greater part of the 3000 km trip, but Chevalier was wrong in his depiction as the three men rode the camels on the final day. Return to Coopers Creek by Nicholas Chevalier. The total distance covered by Burke, Wills and King from Melbourne to the Gulf and back to the Cooper was at least 4750 km, not including the addition reconnaissance excursions. This distance was covered in 183 days travel over a period of 245 days, an average of at least 26 km daily. The majority of the distance was covered on foot. Who’s idea was it to walk across the country ? ‘Menindee’ on the CD Dust © Neil Murray 1995. In 1882, just twenty-one years after the death of Burke and Wills, twenty-year old George Morrison walked across Australia from Normanton to Melbourne alone and unarmed. After failing his medical exams at the University of Melbourne in March 1882, 20 year-old George took the opportunity to continue his travels. After visiting north Queensland and New Guinea he landed in Normanton on the north coast of the Gulf of Carpentaria in December 1882. He announced his intention to walk home to Geelong and despite the protestations of those who thought him mad and his attempt to be suicidal, on the 19th December 1882 he set off to cross the continent on foot – alone and unarmed. He packed his possessions; a warm blanket a large oilcloth, a light hammock, four pairs of socks, white duck trousers, a pair of shoes, three handkerchiefs, two shirts, pyjamas, three books, soap, toothbrush, a billy, quartpot, pannikin and a waterbag. from the heavy falls of rain, that camels could scarcely be got along, it was decided to leave them at Camp…and for Mr Burke and I to proceed towards the sea on foot. Our first difficulty was in crossing Billy’s Creek…in getting the horse in here, he got bogged in a quicksand bank so deeply as to be unable to stir, and we only succeeded in extricating him by undermining him on the creek’s side, and then lugging him into the water. A great deal of the land was so soft and rotten that the horse, with only a saddle and about twenty-five pounds on his back, could scarcely walk over it. Patches of the land were very boggy…we came on an open plain, covered with water up to one’s ankles…one was frequently knee deep in water. There came on a violent tempest of wind and rain. The track became a bog and the knapsack got so sodden with water that I groaned under its weight. The accounts I had heard of the track made me tremble to sit down; so I wearily struggled on through mud and water up to my knees, forgetting the dangers of this dismal, gloomy country in the fatigue of walking. George’s settled into a relaxed daily routine; he had two quarts of tea, beef, johhny cakes and a pint of American apples for breakfast, a cup of cocoa at 11.00 and beef and potatoes, stewed apples with tea for dinner and supper. He camped whenever he became hungry and he wrote to his mother that he was in splendid health, free as a lark and lived ‘happy as the day is long’. The anxiety of my mind…added to my thirst and I suffered torments. All through the night I lay naked on my back, my tongue contracted to a point, my body hot and feverish, my brain reeling. Just as day dawned I staggered to my feet, but which way to turn, to the right or to the left ? I was so dazed that the track became more blurred and indistinct every minute. I was throwing myself down in despair when my eyes lit on a beautiful pool of water under the shade of a..tree. The reaction quite unnerved me. I rested and drank all day. He reached Maneroo Station near Longreach on his 21st birthday and rested. The station manager, Mr Kennedy, invited him to dinner and offered to accommodate him for a week while he recovered from his journey, but George was determined to continue and left the next day. George learnt from his experience as a thirsty traveler and near Thargomindah he walked seventy-five miles without seeing a single person. He found he could go twenty-five miles ‘without wetting my lips’. The long, isolated days ‘seemed the very incarnation of dreary desolation’ and the landscape stretched away to the horizon day after day. After pushing himself on to Wilcannia on the Darling River, George telegraphed home for extra funds which allowed for the additional luxury of two nights in a hotel. He noted ‘when I get to a town, people come to look at me as if I were a gorilla’. After Wilcannia he traveled rapidly through southern New South Wales and into Victoria, where the ‘beautiful hilly country, exceedingly fertile and supporting so excellent type of people pleased me beyond measure’. Exactly four months after leaving Normanton, he walked into Melbourne. The [Melbourne] Age published his story and The [London] Times praised ‘one of the most remarkable of pedestrian achievements’. The rival Melbourne newspaper, The Argus, claimed the journey was a ‘curious and purposeless feat’. After covering 3250 kilometres (2000 miles) in 123 days George recalled the ‘journey was accomplished without difficulty other than that involved in constant physical activity’.